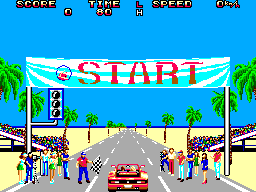 Most people who were old enough can still remember the impression Outrun made on them the first time they saw it in an arcade. Compared to driving games around before it such as Pole Position and Konami GT it was jaw-dropping. It's superb sprite-scaling effect made it look just what it was, the start of a new era for 3D arcade games. In 1987 Sega converted it to the Master System. Could they achieve the impossible and bring the experience into people's homes? 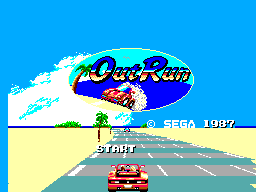 Outrun, for those who don't know, is a driving game against the clock. There are 15 stages in the game, although only 5 have to be completed in order to finish the game. At the end of each individual stage there is a fork in the road, and the direction you take depends on which stage you encounter next. The driving experience on the master system is good. Unlike a lot of the home computer conversions the way the car corners and skids is quite faithfully to the original. The fact that you can hit other cars and not grind to a complete standstill keeps the action moving. The lines in the road and the number of track-side objects help give the game an excellent feeling of speed. Inevitably there are a few things missing from the original. There are no lorries on the roads. When you flip the car it's passengers don't end up on the floor. However there are also things included that you might not have expected to make the 8 bit version such as hills in the road, the overhead 'gateway' in stage 2 and the music select screen. 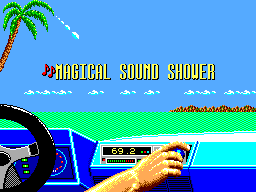 Make no mistake, the graphics in the Master System version of Outrun are awesome. The programmers did an amazing job to get the game to look anything like the arcade. Whilst wanting to review this game on it's own merits, it's difficult not to compare it to the likes of the Spectrum, Amstrad and Commodore 64, and the Master System version blows them all out the water. The first thing that strikes you is the smoothness of the animation. By todays standards it's poor but in 1987, on the Master System, it was smooth as silk. All of the cars are nicely drawn. There's not a lot in terms of track-side detail, but the trees, shrubs, signs and rocks all look good. There's also a nice amount of background detail such as clouds and mountains in the distance. However it's a shame, if understandable, that things like the sea, the rock canyons and the rolling overhead clouds had to miss out. However, the stand out graphical achievement for me has to be the reduction in blocks and flicker that they managed to get with this conversion compared to other big name ports such as Afterburner and Space Harrier. It's still there but it's just less noticeable. One of the best things about the arcade game was the thumping soundtracks and it's pleasing to know that they all made it to the Master System. Each one of them is instantly recognisable and are included in their entirety. Even Last Wave, the moody high score melody is in here. There's not much else in the way of Sound Effects. Squealing of tyres as you skid on a bend, a few beeps as you pass a checkpoint and the odd thud as you hit another car but that's about it. Still, when the tunes are this good who wants to hear sound effects! Controls are as easy as you like. One button to accelerate, one button to brake, up and down to change gear and left and right to steer. The car handles well to your movements and, unlike some driving games, braking actually slows you down enough to stop you from crashing on sharp bends. There's no option to select automatic transmission but with only having two gears (Hi and Low) its hardly a problem. Outrun is not really difficult . If you play it enough and learn where the bends are you'll end up being able to beat it more times than not. However that applies to the arcade version too. I think when I first bought it in 87 I'd managed to see and finish every route within days. The fact I played it to death for years after meant that it had that something special that made you keep coming back, if only to beat your best scores and times. You might wonder if maybe because I'm such a big fan of the original arcade game this review is biased. All I can say is that where possible I've bought Outrun for every home computer or console I've had and I've played some stinking versions. I remember being so excited about the prospect of the game on the Commodore Amiga only to find out it was very poor. I've recently bought the 'jazzed up' version on the Sega Classics Collection for the PS2 and that too is absolute drivel. When done right this game felt so good to play. It was a major, major challenge for Sega to convert it to the SMS and they pulled it off. They knew the limits of the system and managed to push the game to the edge of them limits without forsaking what makes Outrun special in the first place.